Germany is in a holiday mood. In 2017, around 77% of the population made at least one holiday trip lasting 5 days or more, and the outlook for 2018 is also bright. For the first time last year, more than 50 million holiday trips were spent abroad, while at the same time the average travel expenses per person and trip rose to more than EUR 1,000.00. 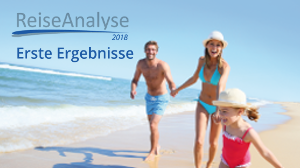 The first results of the Reiseanalyse 2018 were presented at the ITB Berlin 2018.